"Rich, Distinguished, Tasteful: Seeks Same." How could we resist? 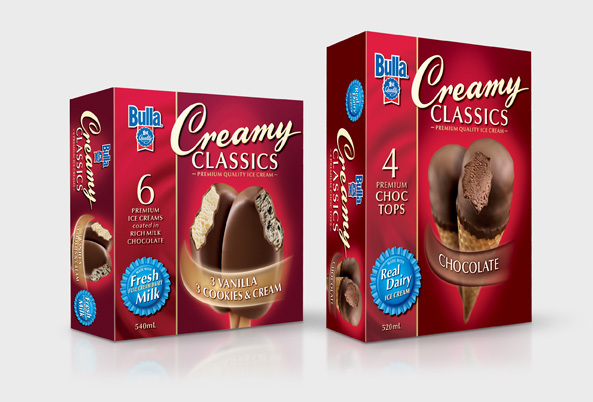 Only a strong visual identity would establish Bulla Creamy Classics as a standout among ice creams. So our design team wrapped these premium confections in a velvety burgundy colour—unique to the category—evoking both indulgence and comfort. 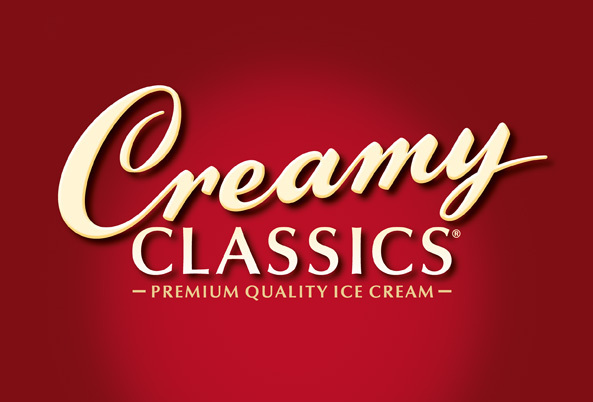 Then, to accentuate these sweets' nostalgic air, we applied a vintage, handcrafted typography to the brand mark. 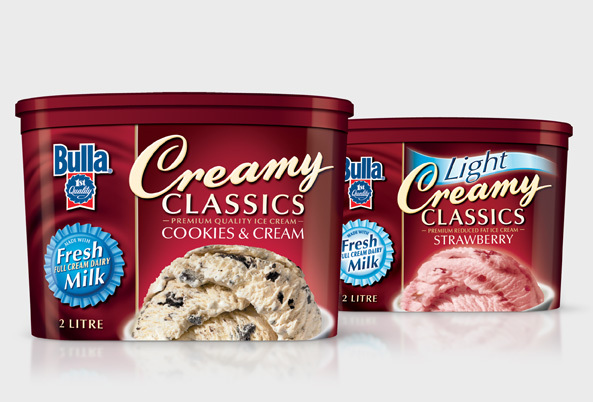 This flexible design extends handsomely across the range, uniting tubs, multipacks, and single-serve sundaes into a distinct romantic unit. 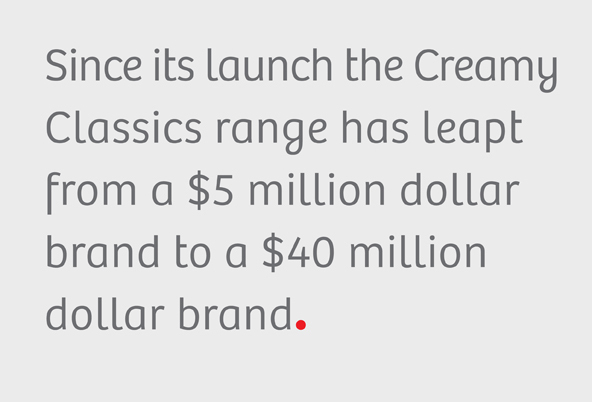 The result is a soothing identity that evokes old-fashioned love—not bad for a range that built brand equity to $40 million in less than six years! 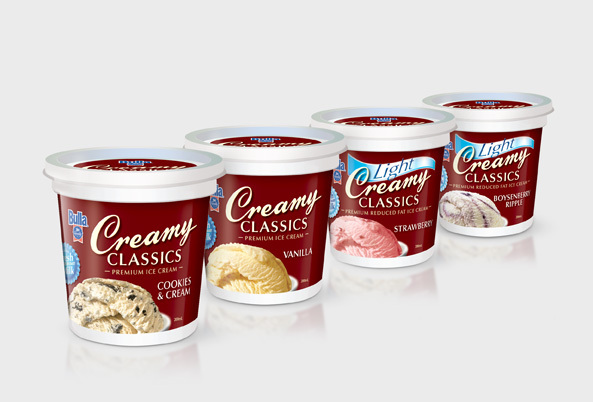 We admit it: we meant to cause a stir. 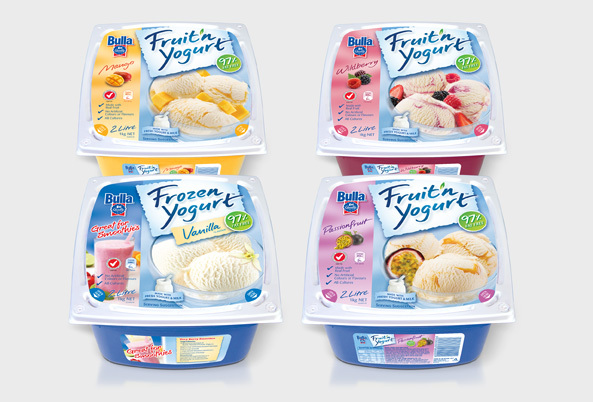 It was our revamped packaging concept for Bulla Frozen Fruit'n Yogurt that shot sales up by 25%. 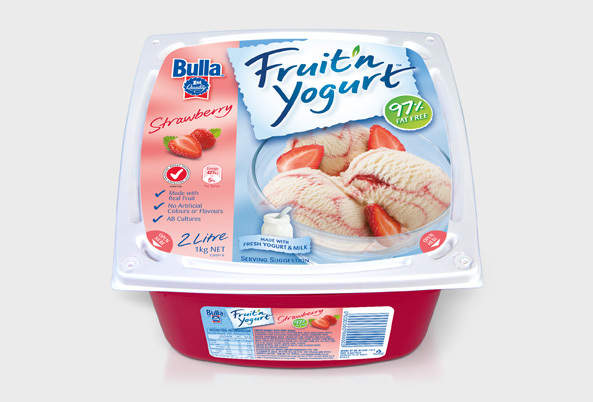 It was our design that walked away with the 2009 Brand Revitalisation Award from the Australian Marketing Institute. We had to do it. After 20 faithful years in the market, these treats were ready for the free and casual style. 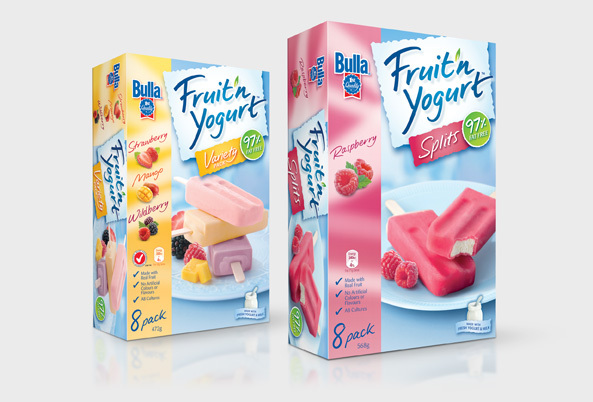 We gave them original, hand-drawn typography to enhance their vibrancy, applied a select-focus, editorial-style photography to amplify their freshness, and put on pastel panels to show off their fashionable flavours. 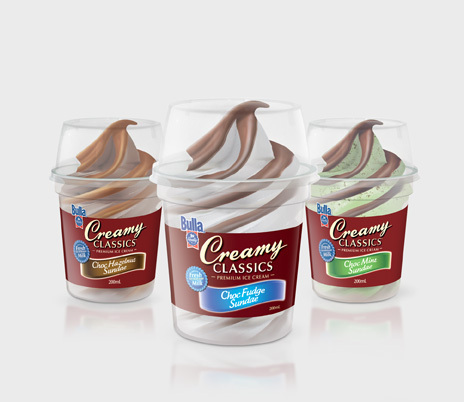 To stay in touch with old friends, the range retained its familiar soft blue colour scheme, merely repositioning itself as "the refreshing, delicious, creamy treat—without the guilt." Without the guilt: we like that part. It was hard to say goodbye to the old packaging. But, like the 50 something who clings to their heyday, it was time to move on. In the true spirit of evolving we leveraged off of what was successful. 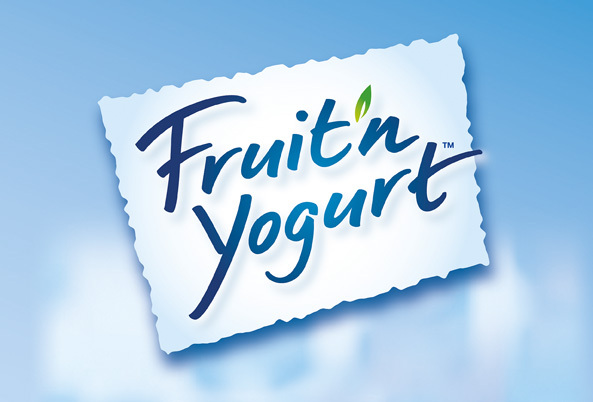 This design was all about communicating assets…fresh milk, and lot’s of it and the fresh fruit ice shell. 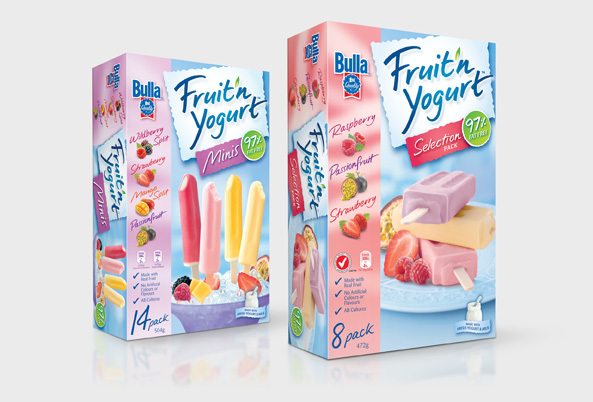 Aimed at families and kids (including the adult kind), we went bolder this time. 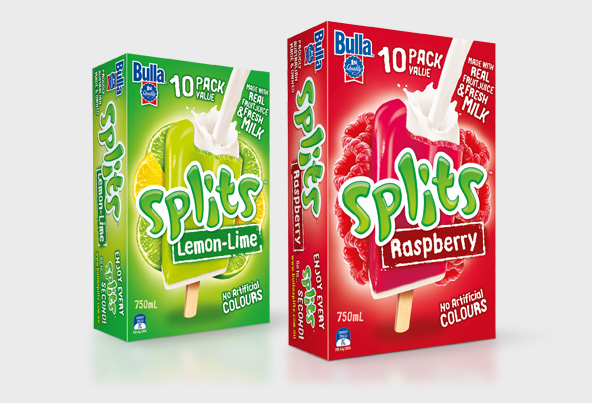 Strong colour coding on each pack for maximum shelf stand out and easy category shopping. 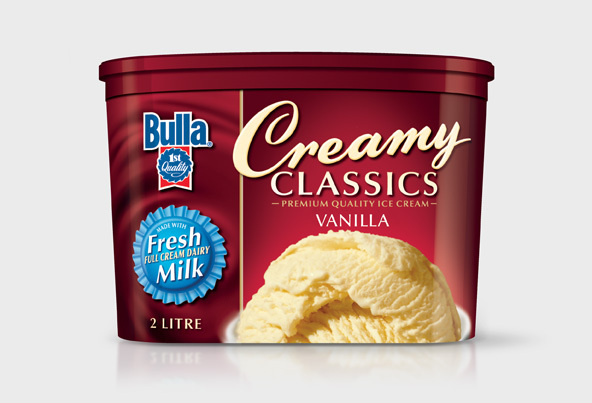 The pouring milk creates an instant visual story of the real ingredients in every ice cream. 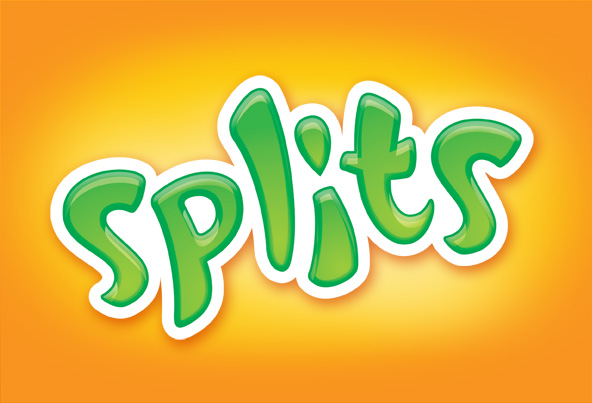 A word whose very pronunciation imitates the meaning of the word is an onomatopoeia. 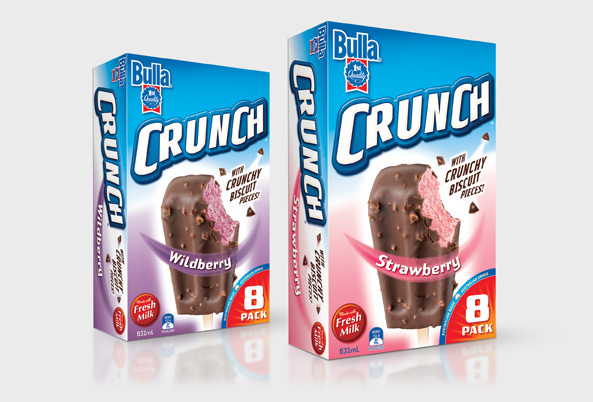 The linguistically satisfying crunch is such a word. 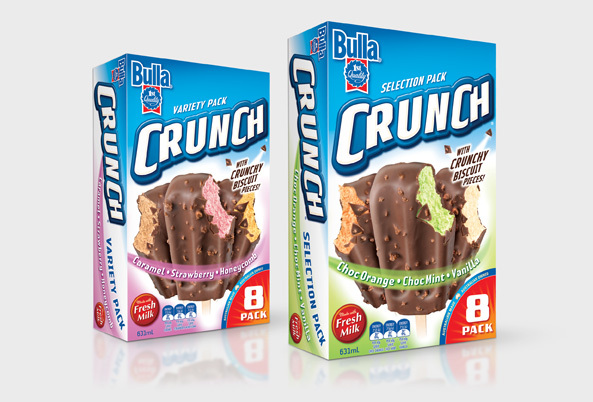 Our job with the Bulla Crunch range was to convey the treats' robust crunchiness with image and colour. 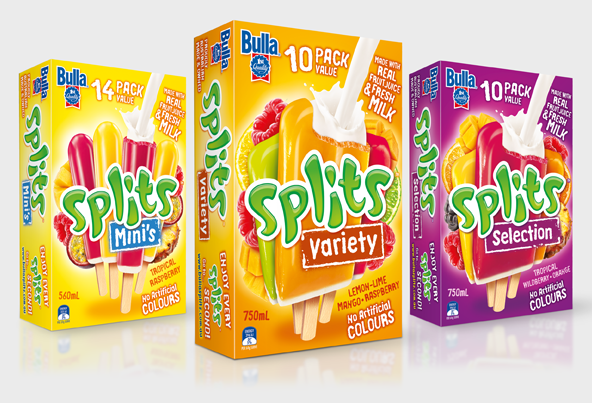 We chose a unifying medium blue to establish a bold sub-brand identity, accenting each flavour variant with its signature colour. 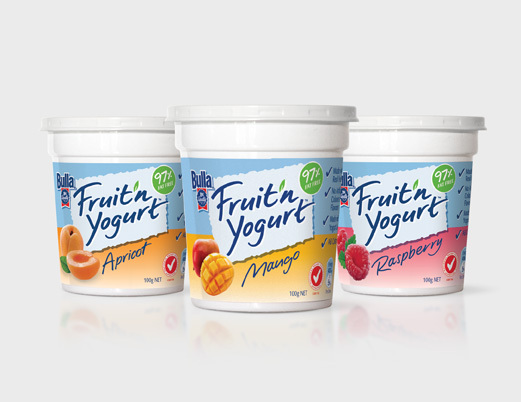 We then layered on product shots in extreme perspective to add energy and movement. 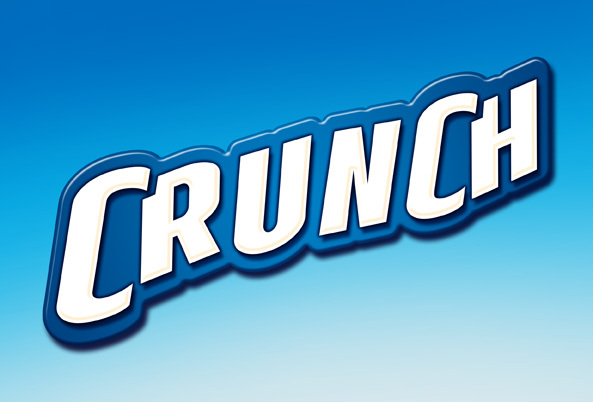 Finally, we echoed the confections' munchy coating with uneven logotype and, crunchiest of all, flying dynamics. Take a bite of that!